What is the price of Inde? The price will be as the price of a small electric car. Then how will be compensated the price of the solar panels, high-tech lightweight materials, the pedaling and amphibian feature? The body is two-seater, hence smaller, hence cheaper. We will focus over creating an only one single version of the vehicle. Most of the companies rely on complicated marketing and offer a large number of versions, but they miss the point to offer the best product. Instead we will continuously improve the design and the quality. The higher price of the high quality lightweight materials will be counterposed by the smaller battery, because the decreased overall mass requires less power. The 3-wheels design is cheaper than a 4-wheels, and the vehicle will be treated by the law just as an e-bike, and certain expenses will be saved* (and for the customers as well). Minimum electronics – the most features will be provided by a software for smartphones/tablets. There is no reason to invest in expensive electronics that will be obsolete in few years. The production will be based in Bulgaria – the country with the cheapest labor available across the European Union, although it's highly qualified. What about the strength of the materials and how long will be their life-cycle? The use of carbon fiber and other composites for the body and many other parts will guarantee the rigidity. The cockpit will be monocoque, which gives much more strength. The door is only one – at the right side, this allows much more strength of the left side. The composite plastics are the best materials for water and elements. When they are UV-protected they last as long as a lifetime. What is the production deadline? Deadline for a start-up project is too early to announce. Anyway, we'll do our best to start it at early 2019, but remember – the way to high quality product is long and full of challenges. Inde is almost a free transportation, but is it suitable for long distances? There will be available a larger battery pack. But as you know today a suitable battery with a high capacity and low weight are very expensive. We will provide a battery rental service and owners sharing service (through our website). Buying batteries is more appropriate for small deliveries business or similar. Am I too old for everyday pedaling? The pedaling with a bicycle and the pedaling into the comfort of a car has nothing to compare. Maybe some of you have experience driving a velomobile, and the difference is really huge. In addition the electric assistance with a relatively large battery makes a profound change, since you may choose to drive with or without pedaling. You may choose from full electric throttle (pure electric mode), high or low electrically assisted mode or no assistance at all. It appears that your dependence of the pedaling is determined by 3 criteria: the mileage you want to achieve for a certain period of time, the stored sunshine energy, and the availability of an access to the electric grid. For example if you plan long trips without a possibility to recharge your battery from the grid, you should consider renting or buying the Battery+ Pack. In many other cases you even may don’t need of any pedaling. And finally – you may learn in deep the benefits of regular cycling here. The driving position is not my favorite, do I have another choice? The front seating is widely adjustable since there will be a lot of leg motions. It will allow high and low position, straight up seating and recumbent positions. The website's pictures show position when the back of the front seat supports the body to counterpose the force, created by pushing the pedals. How safe is this vehicle? This is one of the highest priorities when creating this vehicle – to achieve the safety of a car, and why not even better? Additionally the pedaling is keeping the legs and whole body strong, active and worm, which helps a lot avoiding traumas in light collision cases. How is distributed the propulsion to the wheels? The front wheels propulsion is created by the human with pedals, and the back wheel – with an electric motor. Into the water the propulsion is coming from the electric motor only. There is widely spread myth about the three-wheelers. 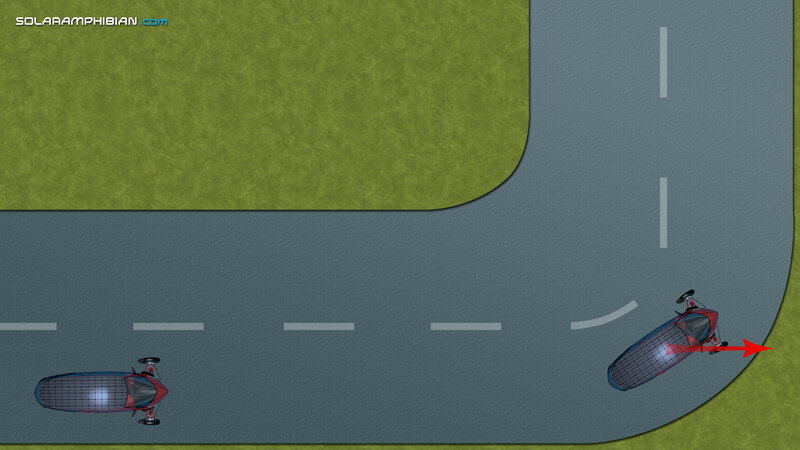 When turning, the centrifugal force is making the vehicle to "escape" at the front diagonal. And the vector of inertia is pointing exactly where the front wheel is, and this way the vehicle has the same stability as a four-wheeler. That's why it is most important to place the two wheels at the front, not the back! Also – there will be a new innovative system for turning stability control, exclusively designed for three-wheelers. The vehicle is less stable on reverse gear. The solution – a speed limiter for the back gear. The removable battery is easy to charge – you may bring it even at your apartment. In most cases everyone needs a short-distance transportation for one or two persons only. Too futuristic to be true. * Please check your local law. Have more questions? You may ask anything on our social media accounts (please choose one from the box on the right/bottom) or share your thoughts with us.